A simple act of kindness is passed through a Ugandan village with surprising results at the end of the day for Tendo. 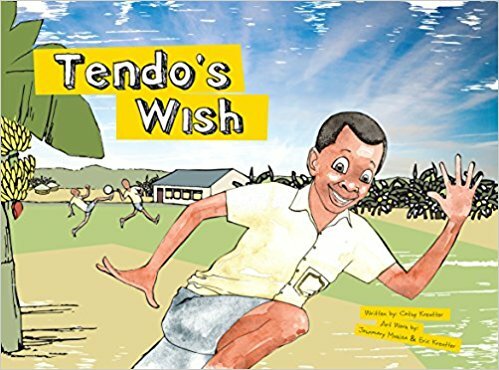 Tendo's Wish is a circle-story about community with a pay it forward feel that will be enjoyed by the whole family. The repetition and rhythm of the story makes this book a great read-aloud for children; furthermore, the humorous illustration and collage style design of the book takes readers through a village setting in Uganda. It is an interesting way to introduce children to the geography and community culture of Uganda, and the simple jobs that people do in rural areas. A map, glossary and interesting facts at the back of the book give further insight into rural life in Uganda and Africa as a whole. Hope you can buy one of their books as a gift this holiday season. You'll benefit more than the person you're giving the book to. Happy Advent and Merry Christmas!